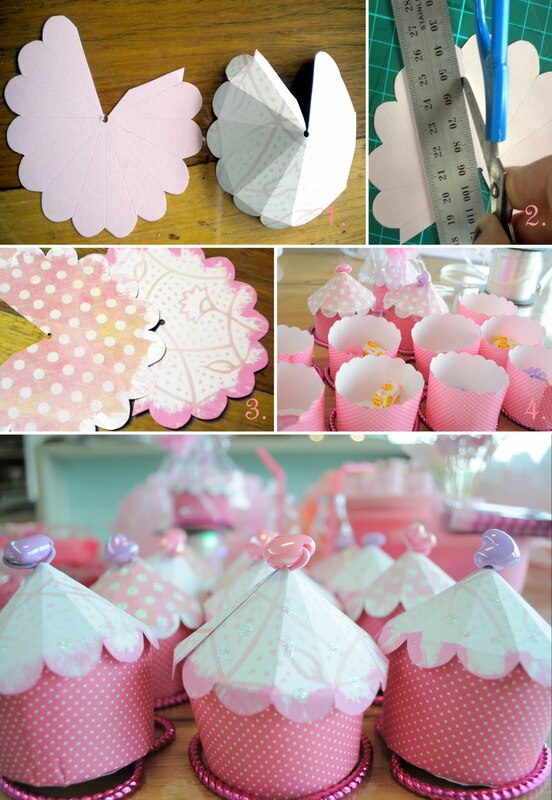 First Birthday Ideas & Inspiration: Cupcake boxes and giant balloons! With my daughter’s first birthday party just over a week away (I can’t believe it!) I’ve been scouring the web for neat decor ideas to help turn a dull park pavilion into a birthday wonderland. Today I came across these adorable little cupcake holders at Myrtle & Grace, how cute are these?! These would be perfect for guests to take a cupcake home with them! I wish I would have found these sooner but I’ve got so many other things to do in preparation I don’t think I have the time! Seems simple enough but tedious work, check out the full tutorial over at Myrtle & Grace. In my adventures looking for first birthday decor inspiration, I also came across this idea, love it! I purchased 3 giant balloons for Baby Digger’s high chair – so fun! I found these wonderful ideas while on Pinterest, I could seriously spend hours on this site. If you haven’t checked it out I highly recommend it! It’s just filled with awesomeness from crafts, fashion, recipes and TONS of inspiration! These are really neat ideas! I My daughter is passed the first birthdays stage but this would be great for even a 5th birthday! Indeed they would be! I love party planning! Great inspiration there! Where do you purchase the giant balloons? I purchased the giant balloons from http://www.BalloonManiacs.com, they were the cheapest and if you wait until the weekend to order they have a 20 percent off coupon! I can’t wait to see your pics of your own party…. I am sure it will be fabulous…. Be sure to stop by A CREATIVE SPIRIT http://www.acreativespirit.com/ often and comment as EVERY comment is an entry in the monthly gift card drawing. Those little favors are so cute! I remember prepping for Lulu’s first birthday last year – and now I have to do it again for Bubba’s first birthday this year…oh help me!! The birthday girl looks so sweet! I had a blast planning my little guy’s first birthday last winter. Already looking forward to planning the second. Blogs are great inspiration for party planning! Hi, I’m a new gfc follower of your blog from Fun Tuesday Hop 🙂 Smile.